The culture of Japan has influenced Western artists and architects since the late nineteenth century. There is a particular link between modern architecture and Japan, a link first established by the great American architect Frank Lloyd Wright and followed by many others since. And not only architects : Western print-makers and ceramic artists have also sought inspiration and technique from the Japanese tradition and continue to do so. 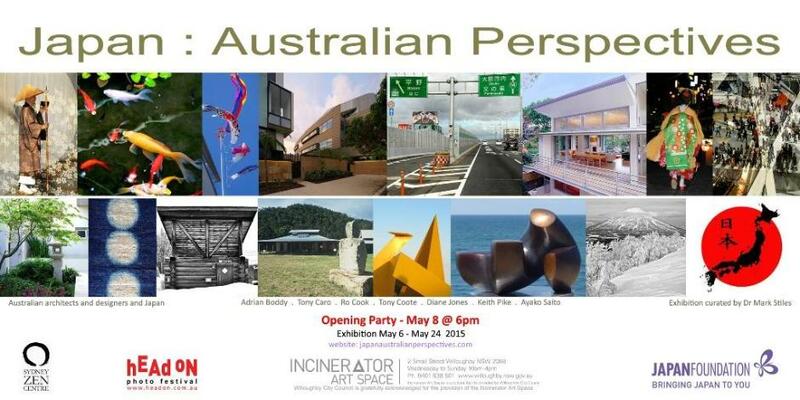 Japan : Australian Perspectives is an exhibition for the Incinerator Art Space. It will present the work of seven contemporary Australian creative practitioners who have been inspired by Japan. The principles uniting the work will be the same ones that attracted Frank Lloyd Wright to Japanese art: its clarity, integrity, elimination of the insignificant and above all its “candid and gracious being” which, Wright said, represented the material means to a spiritual end. The exhibitors include Adrian Boddy (photography), Tony Caro (photography), Ro Cook (textiles), Tony Coote (architecture), Diane Jones (architecture), Keith Pike (architecture) and Ayako Saito (sculpture). All live and work in Sydney. ADRIAN BODDY taught at the University of Technology Sydney for many years and is a former director of its architecture program. He is the principal of Adrian Boddy Photography and his work has appeared in many architecture and design publications in Australia and overseas. TONY CARO is a Sydney architect and the principal of Tony Caro Architecture. He has recently completed work at Jackson’s Landing in Pyrmont and is currently working on a project in the Barangaroo site at Darling Harbour. RO COOK is a Sydney designer and textile artist and a former head of the design program at the Australian Film Television and Radio School. Her interest in textiles has taken her all over Asia and she will be showing some hand-printed drop panels especially made for the Incinerator Art Space. TONY COOTE is a Sydney architect who has been fascinated by Japanese architecture and culture for over forty years. He is a practicing Buddhist and the designer of the Kodoji Zen retreat on the Hawkesbury River which he has been helping to build since 1984. DIANE JONES is an architect and interior designer who is an associate at the Sydney firm PTW. Her interior work for public and heritage buildings has been widely admired and she will be showing some recent projects at the Incinerator Art Space. KEITH PIKE is a Sydney architect whose work has been very widely published. He studied in Japan under the distinguished Japanese architects Arata Isosaki and Kazuo Shinohara and has worked in Tokyo and Hong Kong as well as Sydney. He will be showing five recent residential projects in our exhibition. MARK STILES received his PhD from the University of NSW in 2010. He first visited Japan in 1967 when his parents were posted to the Canadian Embassy in Tokyo, and he has returned many times since. In 2013 Mark curated the successful exhibition at the Incinerator Art Space to mark the centenary of the designers of Canberra, Walter Burley Griffin and Marion Mahony Griffin. Japan : Australian Perspectives promises to be a stimulating look at the important and constantly refreshing relationship between an old culture and a new. To whet your appetite we share four of Pittwater gentleman, Adrian Boddy’s images that may be viewed at the exhibition. In total fifteen of his wonderful photographs will be part of the Japan: Australian Perspectives exhibition. Pondering the past. Garasha Festival, Nagaokakyo, 2009. It is said that Japan enjoys the most festivals of any country. Intimately detailed displays of colour, costume, and time-honored ritual invite the past and present to mingle and rejoice. This young woman was participating in a parade of period-costumed characters. Her eyes are modestly cast down in a moment of private contemplation. The monk’s woven fibre hat is worn to partly cover his face during the alms ritual, or takahatsu, so that neither he, nor those giving food or money, see each others' faces. This represents the perfection of giving. One can also see the monk's plain white kimono under the brown outer cotton or linen robe, called a koromo. What cannot be quite appreciated is the monk’s silent dignity within the hubbub of Tokyo’s urbanity. A layered cherry blossom pattern suggests the monk’s stoic inner calm. Maiko: going, going, gone. Gion district, Kyoto, 2009. Maiko are younger women who formally entertain guests in traditional inns, many of which are located along Gion’s lantern-lit lanes. Like brightly coloured butterflies at dusk, they are seen in their kimono and obi one minute — gone the next. Foreigners often pass by in blissful ignorance. Frames within frames. Goju-no-to pagoda, viewed from Senjo-kaku — the hall of one thousand mats. Peaceful Miyajima Island, or the Island of Gods, lies ironically in Hiroshima Bay. This image illustrates the physical and spiritual power of traditional Japanese timber construction: Senjo’s massive raw-finished columns and beams frame the relatively delicate vermillion structure of adjacent Goju-no-to pagoda. Photographs copyright Adrian Boddy, 2015.